I've never been very good at Math. I've never been able to work the numbers in a way that would produce a correct answer. My mind just never twisted the right way. It just never clicked. The efforts of many math teachers were met with frustration, apathy, or hostility as I just didn't get it and after a certain point, I just gave up. I always knew that when I had children that they would eventually reach an age where I would be unable to help them with their homework. I didn't know that age would be 6. 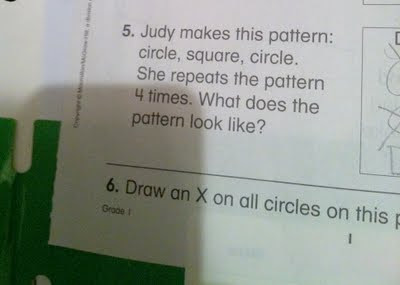 I was helping Hadley with her homework and she was instructed to make this pattern: circle, square, circle. Then repeat the pattern 3 times. So I thought she should draw circle square circle and then repeat - from the beginning - circle square circle. Hadley insisted that she should write circle square circle - and that the third circle counted as the first circle of the second sequence. Are you still with me? Really the specifics don't matter, but what does matter is that I had to call three people to double check Hadley's first grade math. For the record, I was correct. And there really is no joy in outsmarting a 6 year old. ME: Justin, I'm in a slump. I have nothing to blog about. JUSTIN: Why don't you blog about how you got confused helping Hadley with her math homework? ME: Justin, my god, I don't want to write things that make me look stupid. Justin shook his head at me and walked out of the room. I realize I'm no genius, but I'm pretty darn sure I was just insulted.